When you look at how much Texas drivers hand over to Washington and how much comes back, it’s easy to feel like the feds don’t like us much. Federal officials do not “directly” return a whopping 78 percent of fuel and vehicle taxes collected in Texas. That’s second highest among states; behind Iowa with its 84% bye-bye rate and well ahead of third-place Florida. Unfortunately, though, there’s a bigger untold story here. Officials invested more than half of those collections into projects straddling one or more states. And the data doesn’t show how those amounts were distributed among states. So the 78% no-return likely isn’t as bad as it looks. Texas probably received more. Still, hover over the interactive map above and you’ll see a wide range of give and take, including Alaska’s 60 percent gain. Usually, when a road is riddled with potholes, the solution is to patch or repave. But in South Texas, where big trucks servicing the state’s latest oil boom are pulverizing pavement, the state’s answer is to tear up the asphalt and return the roads to gravel. Posted speed limits then have to drop from 55 mph to 30. While the gas and oil boom is boosting state revenues by some billion dollars a year, the Texas Department of Transportation still largely relies on a two-decade old gas tax that inflation has cut in half. Lawmakers just can’t find the gumption to raise the tax, and don’t sound confident about other possibilities. With the Legislature going into a special session to tackle the problem, KLRN TV’s Rick Casey lays out the issues in this 4-minute video. Here’s the text. The candidates’ (major candidates only) policy statements are evaluated in order of their current polling numbers, Republicans first. 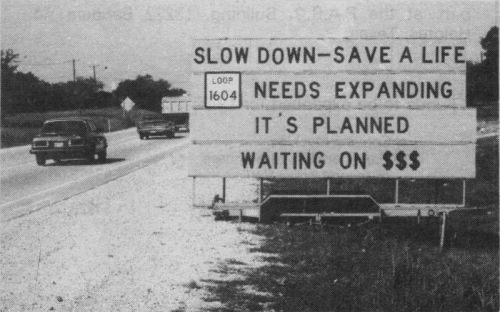 Congress has yet to approve a new, comprehensive surface transportation bill to replace the previous legislation (known as “SAFETEA-LU”) that expired last year, instead opting to keep it on life-support through a series of short-term extensions. 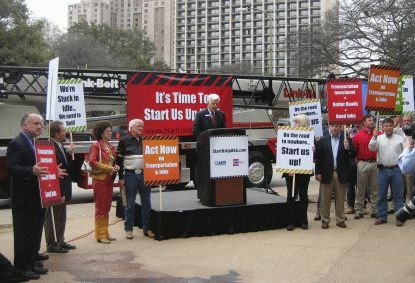 The resulting lack of certainty over future funding– as well as limited funding in those extensions– is severely crippling the construction industry, that according to several speakers at a noontime rally outside San Antonio’s convention center yesterday that attracted about 100 people. 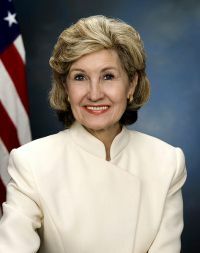 For the past week or so, I’ve been watching the drama unfold as Kay Bailey Hutchison announced the transportation plank of her platform for governor and the ensuing television ad and Rick Perry’s counter-ad. The use of the DMS signs was clever, but her message shows a both continuing lack of understanding of the core issues on her part as well as a bit of a dichotomy. During my daily review of transportation news, I came across this the-sky-is-falling press release by staunch toll-opponent Terri Hall and her TURF organization. As usual, TURF shows a continued lack of insight of what’s actually happening and peppers the article with their predictable array of tried-and-true rhetoric, fallacies, and mendacities as they denounce the large number of projects that are listed as possible toll and Comprehensive Development Agreement (CDA) projects in the new 25-year regional transportation plan. 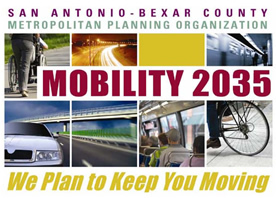 Yes, there are a substantial number of toll-option projects in the plan. However, the outright panic by TURF is premature and demonstrates their failure to see and comprehend the bigger picture and actually jeopardizes badly-needed future projects. This, my friends, shows real courage and a real understanding of the transportation funding crisis that has lead to the plethora of toll road projects around the state.